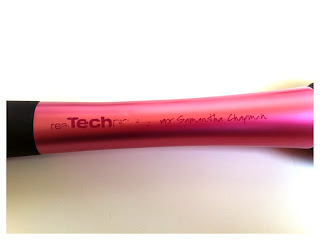 I LOVE Real Techniques by Samantha Chapman brushes! Ever since Sam (one-half of pixiwoo) launched her makeup brush line, I have been using them and loving them every time I do my makeup. 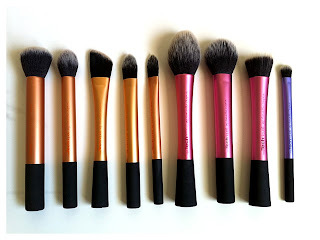 The majority of the time that I am applying my makeup, the makeup brushes that I use are mainly the Real Techniques brushes. 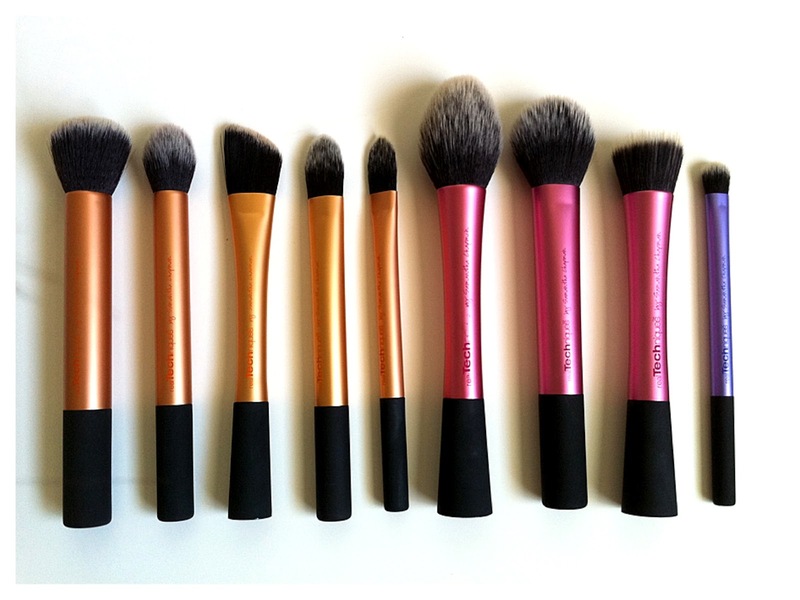 I do have other brushes from MAC, EcoTools, Sonia Kashuk, ect. but the Real Techniques brushes work so amazingly for the price. Not to mention that the design of the brushes are so cute! The brushes that I own from Real Techniques are from the Core Collection Set, Travel Essentials Set, the Stippling Brush, the Foundation Brush, and the Blush Brush. All the brushes are very affordable and the brush line ranges from $6-$18, including the brush sets. All the brushes are made with hand-cut taklon bristles, an aluminum handle, and a flat bottom for your brushes to stand up! The brushes are color coordinated where the gold brushes are for base makeup, the pink brushes are for face/cheek products, and the purple brushes are for the eyes! 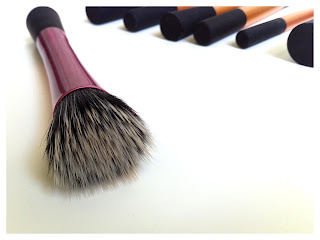 Even though the brushes may look like they are dual fibered they are not, only the tips of the bristles are white, which actually makes it easier to see how much product is on the brush and how much you are applying to your face. The brush cleaner that I use is the MAC Brush Cleanser and I find that these brushes are the easiest to clean out of all of my other brushes. 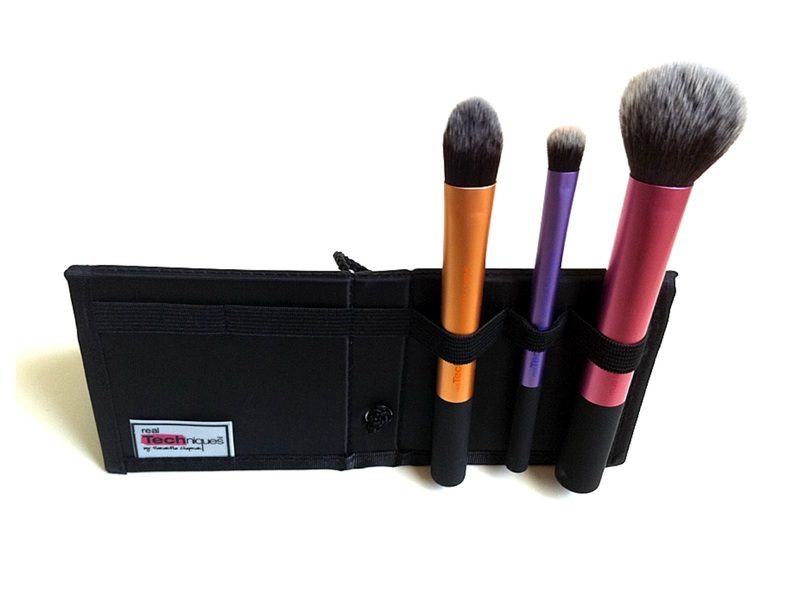 The Core Collection Set comes with four brushes and the panoramic brush case. I actually have 3/4 of the brushes and I will explain the reason later on in my review. The four brushes that comes in this set are the buffing brush, detailer brush, contour brush, and pointed foundation brush. The Core Collection Set retails for $17.99 USD. The buffing brush is my favorite brush out of all the brushes in this set and it works amazingly to buff on liquid or powder foundation. It buffs in liquid foundation flawlessly and it does an amazing job to buff in powder foundation to its highest coverage without ever looking cakey! 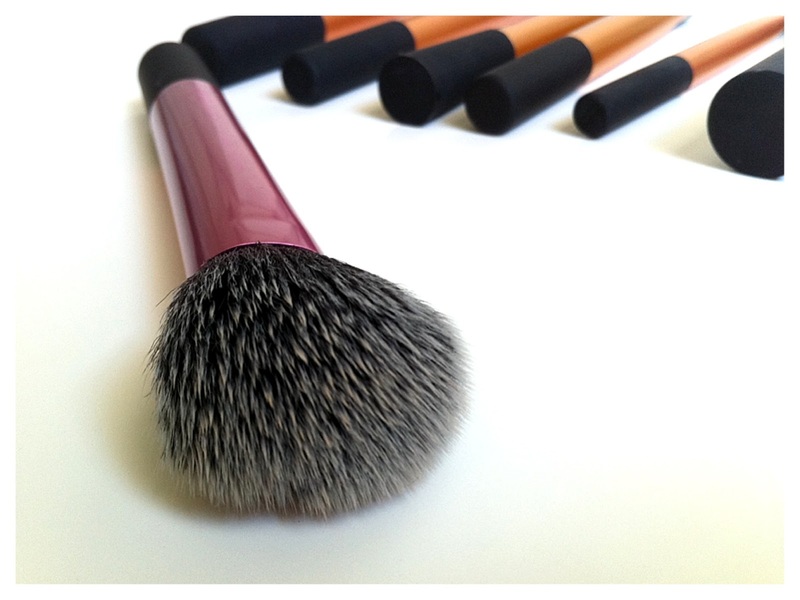 This brush also does an amazing job for contouring, cream blushes, or to buff out any harsh edges. Unfortunately, out of all the Real Techniques brushes that I own this is the one that shed, a lot. One side of the brush completely just had chunks of the bristles falling out. Chunks of hair! I actually didn't use the brush for a while, since the bristles just kept falling out in chunks, however it eventually came to a point where it stopped, so I fortunately can now use it normally again. The shape on the side has changed and flatten a bit, but it still works just as perfectly as before. I have not heard this happen to anyone before, so I'm pretty sure I just got a dud, but it still is a fantastic brush and I would buy the whole Core Collection Set just for this brush again! The contour brush tapers out nicely and is the perfect size to highlight or contour your face. For some people, the brush head maybe too small to contour the face, however I find it perfect for precision contouring. It gets the bronzer exactly where I want to sculpt my face. I also love it for highlighting my face, since it is the perfect size to placing highlighter on the cheekbones. 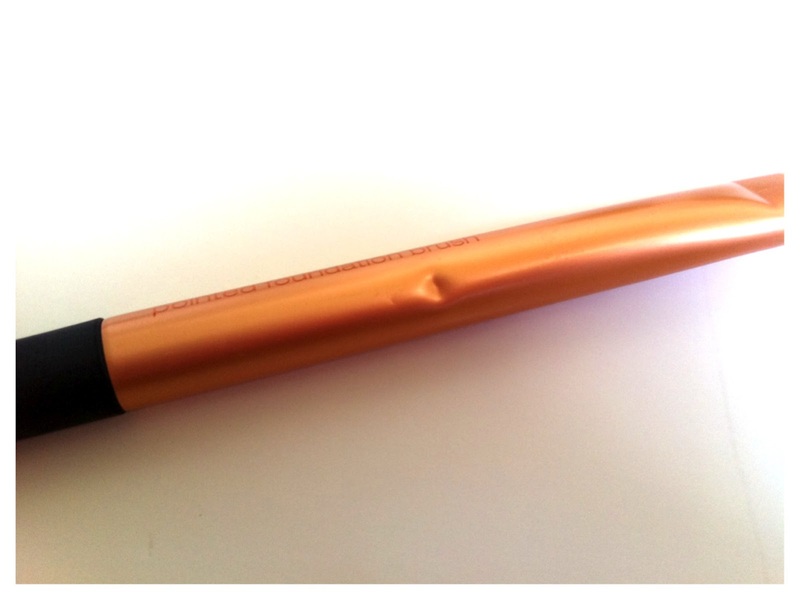 The pointed foundation brush is great, but not for foundation. It is way too small and thin to apply foundation effectively, however it is really good to apply concealer under the eyes or on large areas of the face. It is pointed enough to get around the nose and to really get in the inner corner of the eyes to put concealer and to apply the concealer under the eyes quickly as well. 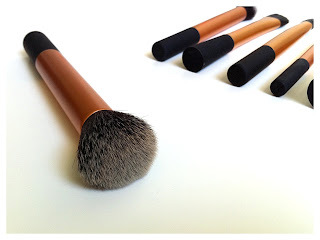 Great concealer brush, bad foundation brush. Unfortunately, I do not currently have the detailer brush to show an actual picture for you guys because I gave it away to a friend, however I did used it before and I do know how it performs. The detailer brush is very tiny and is great for pin point concealing and to apply lip products. I personally don't do pin point concealing or usually apply my lip products using a brush, so I gave it away to my friend. The brush has good precision though and is great for the uses that I stated. 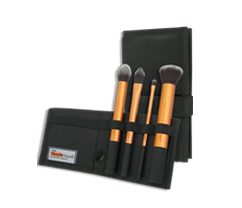 The Travel Essentials Set comes with three brushes and the panoramic brush case. The three brushes that comes in this set are the essential foundation brush, domed shadow brush, and the multi task brush. The Travel Essentials Set retails for $17.99 USD. The essential foundation brush is slightly better for foundation than the pointed foundation brush, however I still find it too small to apply foundation quickly enough. The essential foundation brush is thicker, so it does apply foundation better, but it would take too long to apply foundation to the whole face because the size is so small. 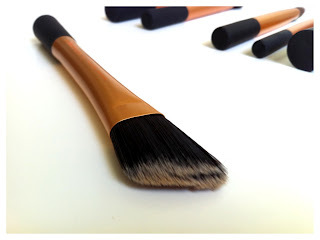 If you have the time to work the foundation all over the face with this brush, then it can be good for foundation, but I would still suggest using it for the same uses as the pointed foundation brush. I really like how this shadow brush is not completely flat, but not completely domed/rounded shaped as well. 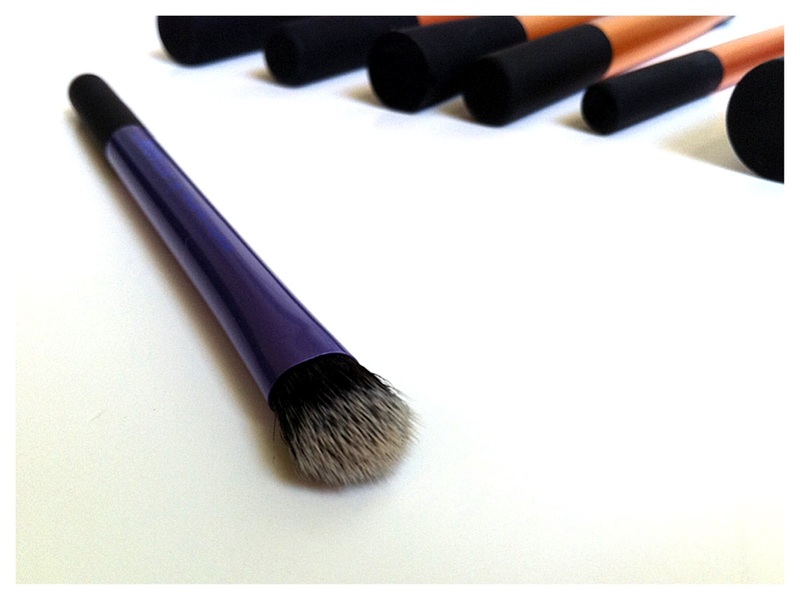 The shape of the brush allows me to apply shadow on the eyes and blend out eyeshadow as well. I actually like this brush better for applying concealer, rather than eyeshadow for me, since I have small eyes. If I were to use this as an eyeshadow brush, then I would just use it to apply one eyeshadow all over the lids or to blend out eyeshadow, but I mainly use this to apply concealer. I find that this brush applies and buffs out concealer under the eyes really well. My favorite brush out of the whole Travel Essentials Set! I actually bought the whole set just for this brush alone and I really like it! It is so soft and fluffy! 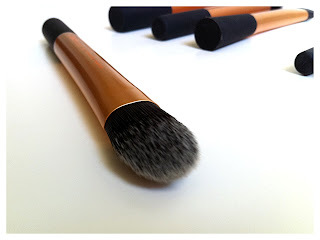 It really is a great multi-tasking brush, since it has various uses for face makeup. It is great for blush, bronzer, and powder! I really like to use it for blush mainly, since it is the perfect size! Not too big, not too small. Perfect size to apply blush and blend it out! 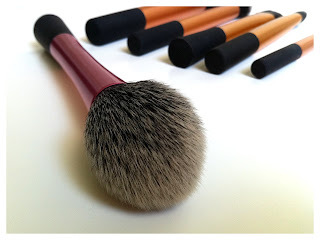 The brushes that are individually sold from Real Techniques varies in prices and the brushes that I have are the foundation brush ($7.99 USD), blush brush ($8.99 USD), and stippling brush ($9.99 USD). 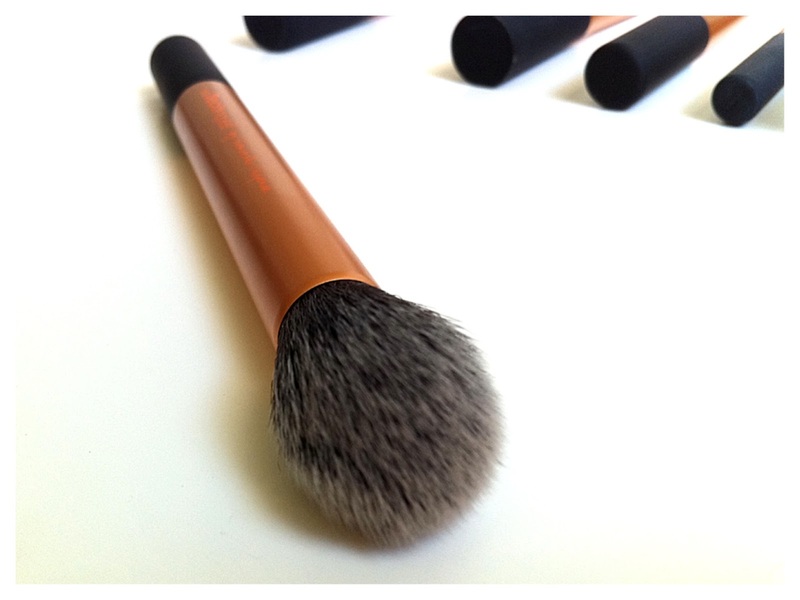 The foundation brush is big and thick enough to apply foundation very well! This brush would be great for anyone that likes to apply their foundation the standard way by using a flat synthetic foundation brush. This foundation brush is angled, so it is great to get around the nose and around areas that are usually hard to apply foundation around. You will get the highest coverage out of your liquid foundation with this angled and flat foundation brush. Some people love this for blush, but it is way too big to apply blush precisely on my face. However, I absolutely love this brush for powder all over the face or for bronzer. I actually use this brush every single day to apply powder to my face. It is domed shaped when you regularly use it, however it does taper to a point! I usually squeeze the brush a bit and it tapers to a perfect point for me to apply bronzer on the areas of my face that naturally hits the sun. I really love the shape of this brush and would definitely purchase another one! 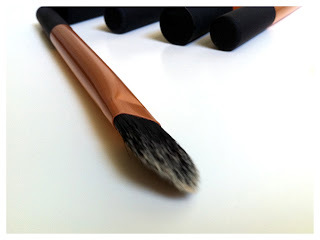 The stippling brush is absolutely my favorite brush to apply liquid foundation. It is really an "airbrushing" brush! The finish I get is so flawless and I find that I don't waste product with this brush at all. It does what a stippling brush should do! The difference between this stippling brush and the generic stippling brush is that the bristles are short and compacted together. I find that the generic stippling brushes, like the MAC 187, has bristles that are too long and "floppy", which results in major brush streaks with the foundation on your face! Since the Real Techniques stippling brush has bristles that are dense and short enough, I find that when I stipple my foundation on and then start to buff it out using this brush, it buffs the foundation in perfectly! I find this stippling brush lovely for foundation and it will give you a more airbrush finish with your makeup. This brush also works really well for cream blushes. 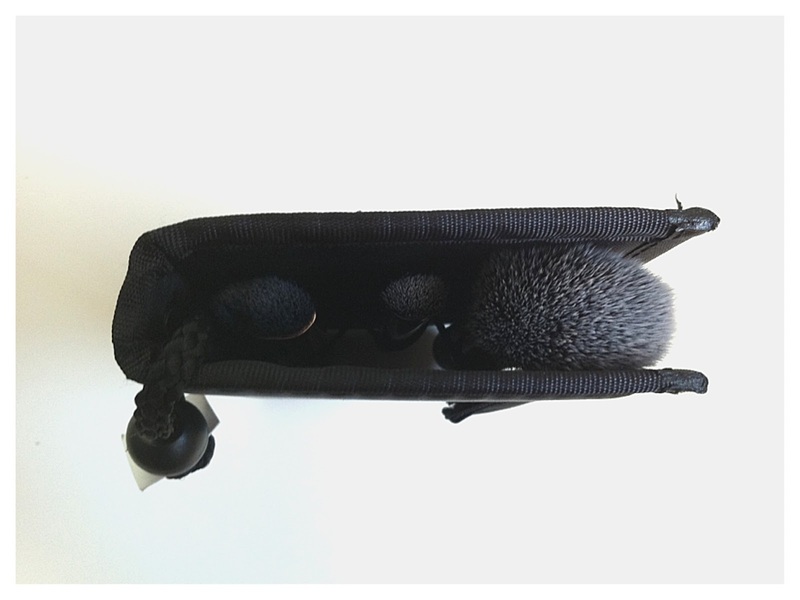 The panoramic brush case only comes in the brush sets and is not sold separately. I think the idea behind the panoramic brush case is very nice, however I don't find it very effective. First off, there are slots to put 6 brushes in the case, however it can only really hold three or four, depending what brushes you put in it. It just does not have enough room to put in many brushes and close it properly. Secondly, you can't have the case propped up on your desk/table and then easily take or put the brushes back in its elastic loop every single time you are doing your makeup. The elastic loops on the case are very strong, so you would have to stop what you are doing and use your hands to push the brush back into the loops. It is just a slight hassle that is not very convenient. Thirdly, the only good thing that I can see from having this case is nicely displaying six of your Real Techniques brushes when you are not using them, or you are going out of town and only need to take three or four brushes. I find that the words can rub and come off sometimes on the brushes and since the brush handle is made of aluminum, they can have dents. However, I have only had those problems on two or three of the brushes. Again, I LOVE Real Techniques by Samantha Chapman brushes! They are affordable, great quality, and great design! If you love makeup and you use makeup brushes, you need to get the Real Techniques by Samantha Chapman brushes! If you guys have any questions, feel free to comment down below! Thank you so much for reading! these brushes look sooo soft! wow these brushes look so pretty! i love the colors of the handles! wondering if they have an online shop or ship internationally? Real Techniques can be purchased online and you can check through the Real Techniques website if there are any places online that will ship out to Australia. I love this post! So detailed! Im off to buy them today! Wow amazing makeup brushes, so cute. A makeup enthusiast that loves to share her beauty favorites and write makeup reviews! All pictures featured are taken by me, unless stated otherwise. Hello + Products I'm Currently Using!